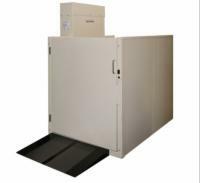 A commercial vertical platform lift can make any public building or workplace full accessible to those with mobility limitations. AmeriGlide’s commercial lifts are specially designed to be reliable and durable enough meets the demands of any tough environment. In addition, each model comes with the industry’s best warranty so that you can rest assured that your lift will last for years to come! Enjoy the best in products at the lowest possible prices when you shop with AmeriGlide of Southport. 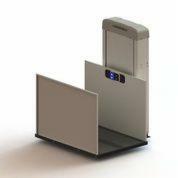 Stop by our local showroom today to speak with an expert and test our lifts in person. 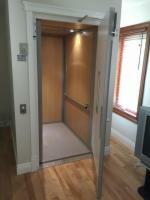 This reconditioned vertical lift has a 750 lb. 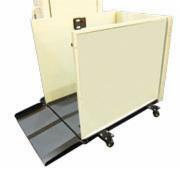 capacity, a safety pan, a 42" guard panel, handrail, and a solid platform. Commercial use. 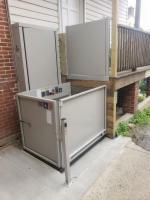 Just roll this portable lift into place, lock the wheels, and plug it in.